A Japanese martial art, based on principles of movement and redirection. Martial arts differs from sports as we focus on the ability to defend without being matched to the size of attackers. 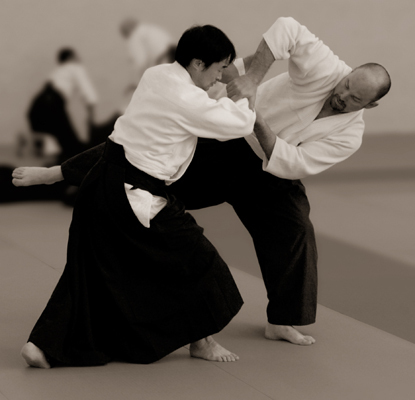 In Aikido we focus on moving around strikes (rather than blocking) which is why Aikido is taught by many police and security groups around the world. Practice includes weapons understanding and multiple attackers making it more relevant to today’s society. Who we are - The UKA is the one of a very few number of organisations recognised by the Aikikai Foundations (World Aikido Headquarters) with all our principles and instructors receiving recognition directly from Japan. Any one year a number of our members will travel to Japan to expand their practice. The UKA was formed in 1986 and includes members who have been practicing since Aikido first arrived in the UK in the 1960’s. 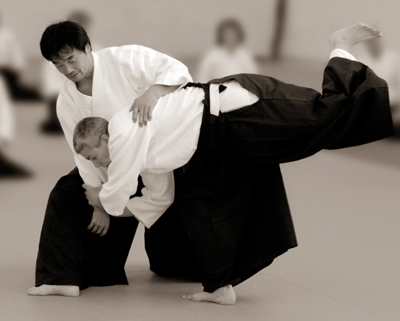 What we do - The UKA practice traditional aikido. This is aikido laid down by the founder Morihei Ueshiba and focuses on martial principles rather than any sport or competition focus.